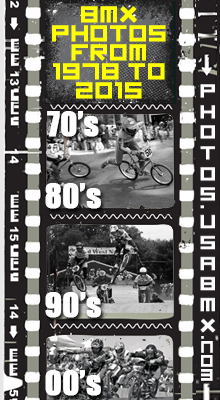 Since our inception in 2011, Box Components has been committed to manufacturing the highest quality bicycle components. 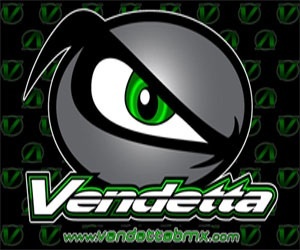 Providing racers and riders with the best and safest products on the market has always been our number one goal. 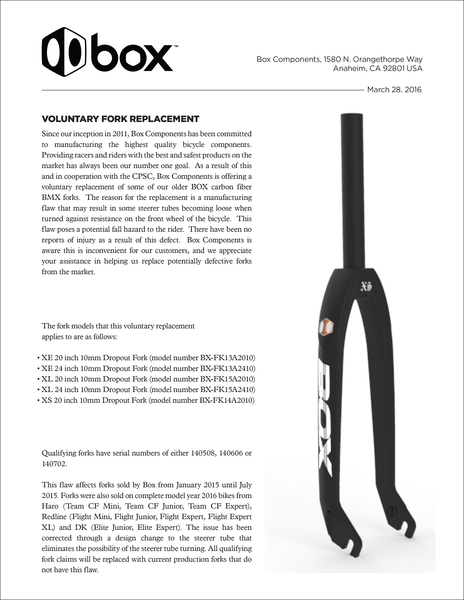 As a result of this and in cooperation with the CPSC, Box Components is offering a voluntary replacement of some of our older BOX carbon fiber BMX forks. 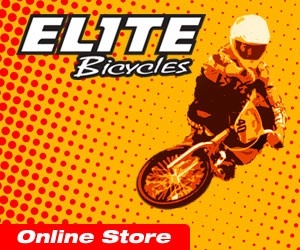 The reason for the replacement is a manufacturing flaw that may result in some steerer tubes becoming loose when turned against resistance on the front wheel of the bicycle. This flaw poses a potential fall hazard to the rider. There have been no reports of injury as a result of this defect. Box Components is aware this is inconvenient for our customers, and we appreciate your assistance in helping us replace potentially defective forks from the market. Qualifying forks have serial numbers of either 140508, 140606 or 140702.
eliminates the possibility of the steerer tube turning. All qualifying fork claims will be replaced with current production forks that do not have this flaw. 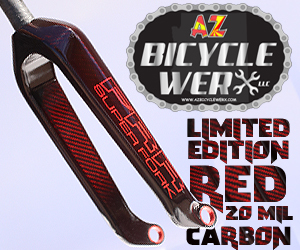 • The serial number is laser etched on the steerer tube. This number will either be 140508, 140606 or 140702. 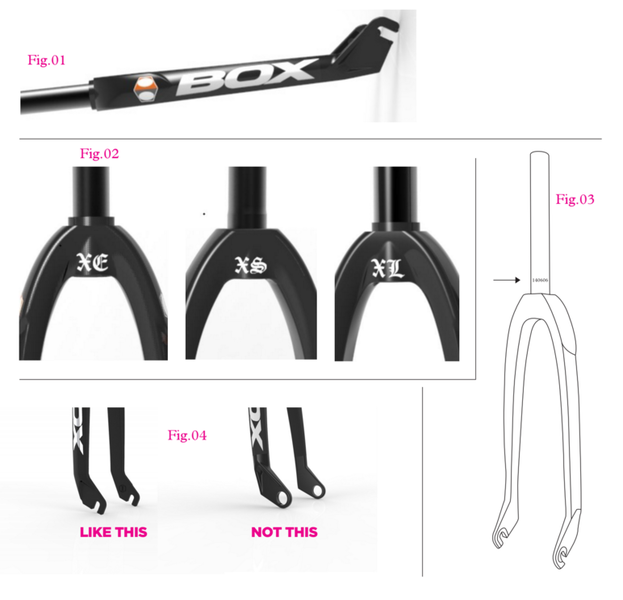 If the fork model and serial number match the information provided above, the fork is eligible for replacement.Consumers should take their fork to their nearest local bike shop or inspection. 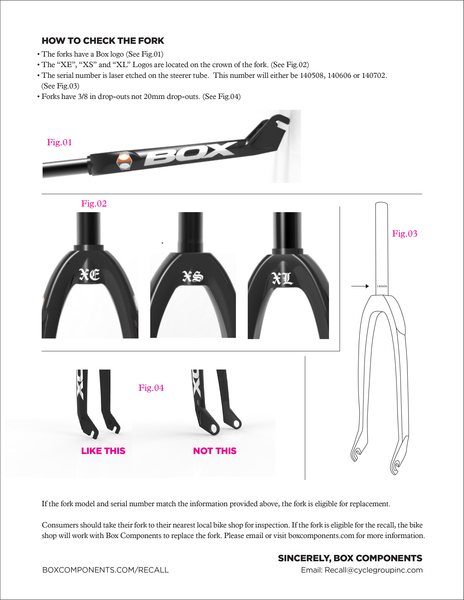 If the fork is eligible for the recall, the bike shop will work with Box Components to replace the fork. 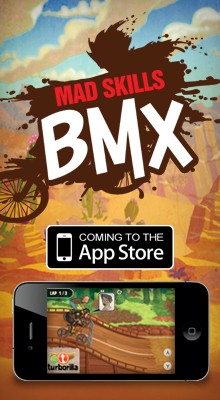 Please email or visit boxcomponents.com for more information.